Like many of you, I pick up ideas from other blogs, TV and Pinterest all the time. It’s wonderful to have so many sources of inspiration! 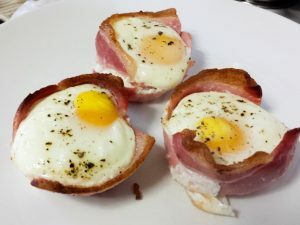 The idea of forming bacon into little cups in which to bake eggs is one I’ve encountered so often I can no longer recall where I saw it first but it’s a very simple thing to do and a way to present the same old ingredients a little differently. 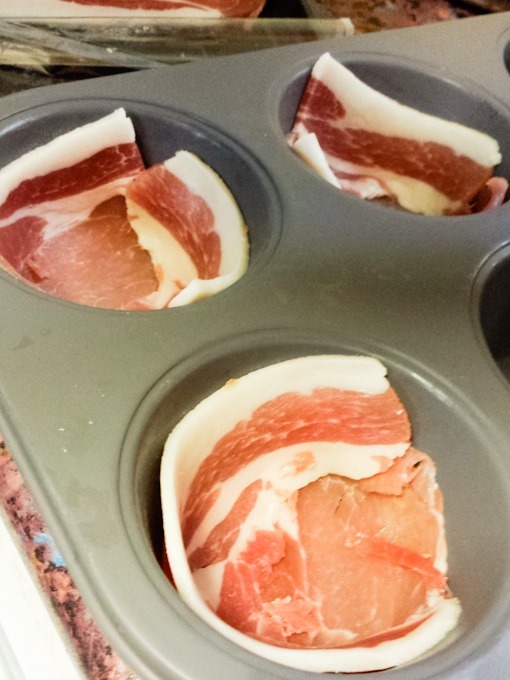 Arrange your bacon slices into a muffin tray to make cups, pushing firmly where the pieces overlap, to make a better seal. Using back bacon, we found it easiest to cut each slice into two pieces first, and use the large end at the bottom of the compartment. 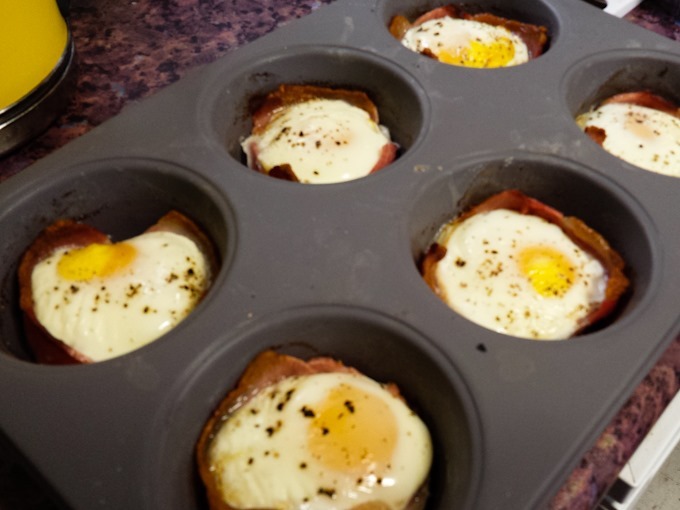 Crack an egg into each compartment and season with salt and freshly ground black pepper. Bake in a preheated oven at 180C until the egg whites have set, approximately 10-15 minutes. 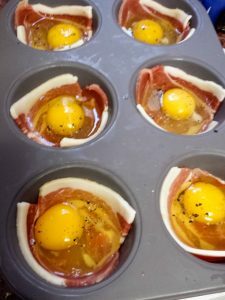 The bacon baked eggs should pop out of the tin easily, as the bacon fat will have naturally greased the compartments as they cooked. Serve hot, with fresh bread and perhaps some silky home-made Hollandaise. Next time, I may add some baby spinach leaves under the eggs, or grate some aged Comte over the top before baking. 16 Comments to "Quick Brunch: Bacon Baked Eggs"
What a great idea, especially for large numbers. I have not come across this elsewhere – thanks for sharing. Lovely idea. We do them in tomato halves, baby cabbage halves and onion halves etc, so why not in bacon cups! Oh that’s a great idea too! Must try it! Very tasty, quick and easy – was just the perfect thing for a light yet filling lunch with minimal washing up afterwards. I sprinkled a little paprika on mine just to spice it up a little. Oh paprika, how perfect. Glad you enjoyed! I made these for Sunday brunch and they were great – easy to make and tasty to eat. I think my bacon was a little too thick to properly crisp up, and I agree with your suggestion of adding a little grated cheese next time. 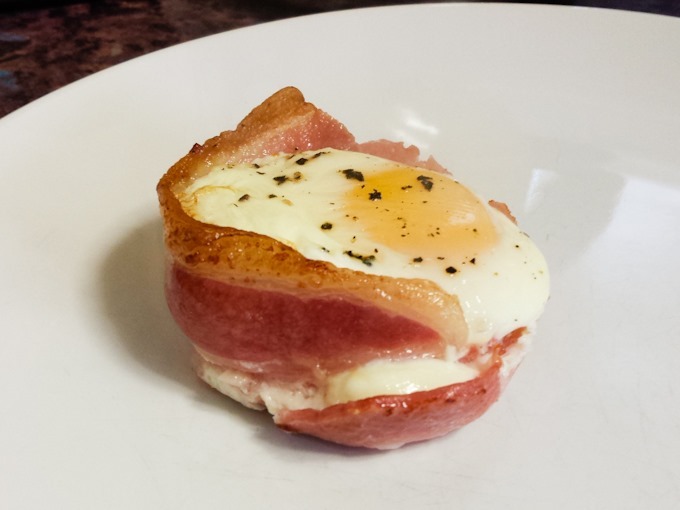 I’m also pondering trying this with Parma (or similar) ham. Would definitely give it a try. 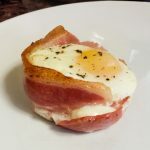 My only worry with parma (and I’ve not tried it so don’t know for sure) is that it’s so thin, the exposed edges might burn in the time it takes for the egg to bake. But a slightly thicker sliced regular or cured ham might work very well! A timely post as I had a house full for Sunday brunch. I love recipes that are easy to do yet look and taste great. We added a teaspoon of spicy tomato and apple chutney before cracking in the eggs and served on a toasted English muffin. Went down a treat and was a lot less washing up for me than usual. Thanks! Oh what a great idea, love the chutney tip! Glad you liked.